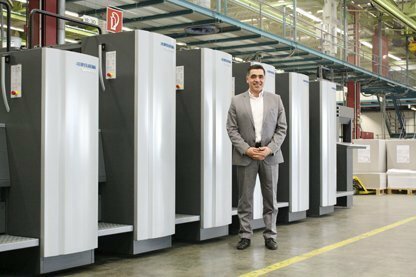 Ersin Sözer, Managing Director of Werbedruck Petzold GmbH, in front of his press at the Heidelberg site in Wiesloch-Walldorf. WP is the first field tester of the Speedmaster CX 75. As a flexible and economical straight printing press in 50 x 70 cm format, the Speedmaster CX 75 can process substrates ranging from lightweight paper through to rigid cardboard (from 0.03 to 0.6 mm) thanks to its double-diameter impression cylinders. The presettings from the prepress stage for preset functions from the feeder to the delivery can be integrated via the Prinect digital print shop workflow, ensuring high productivity. Switching from the last sheet in one run to the first good sheet in the next can be done in under five minutes. The press is compact but with generous space between the printing units for good access and therefore quick and easy operation and maintenance. The Speedmaster CX 75 from Heidelberg is a Multi-Talent that prints both thin and thicker materials and makes it easy to get started in packaging printing. 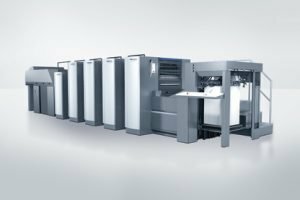 With the Speedmaster CX 75, Heidelberg is closing the gap between the Speedmaster SX 74 and the Speedmaster XL 75 and rounding out its portfolio in the 50 x 70 cm format. The new press will appeal to customers in growth markets such as India with commercial printers migrating to carton printing – printers who need high flexibility but for whom a large number of automation components do not make economic sense at current volumes. The Speedmaster CX 75 will also be of interest to those print shops in industrialized countries that operate one or two shifts and are looking for an attractive price-performance ratio.